Honeysuckle, aka Honey, is a gem of a girl. People regularily approach me at shows asking if she is for sale. Well, at last she is. Her fleece is the rich color of honey, and it sports the trademark high frequency, high amplitude crimp I consistently get from the Ivy - Captain Jack Sparrow cross. Then I could go on about the fineness, bundling and consistency, but I don't want to leave out her great conformation. She is an ideal girl for any breeding program. As a daughter of Ivy and Jack she was meant for the showring. Honey has taken home blue and purple ribbons. 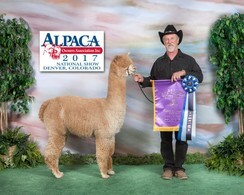 In October, 2011 she brought home Color Champion in Medium Fawn Females. Honey is a cornerstone girl in my breeding program. 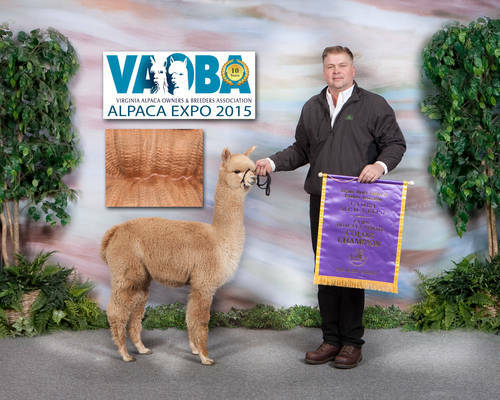 If you want excellent fleece characteristics and genetics teamed with excellent conformation, then this is the perfect girl for you. I strive to improve each generation of my herd. Honey has produced that in spades with this year's cria out of El Nino's Accoyo Michelangelo - a light fawn girl that's a knockout. Her fleece is stunning! She's called Lullaby. Honeysuckle is due 5/30/2016, bred to Ryans' Cormac, multi-blue ribbon sire with elite fleece. Honey's 2010 micron is 18.5 AFD, 3.9 SD, 21.2 CV, and 1.3%>30. Her 2011 micron is 18.3 AFD, 4.1 SD, 22.2 CV, and 1.7%>30. Now that's consistency and a genetic predisposition for fineness! Irish Meadows' Nectar was a gorgeous 3 time halter champion female with a long show career ahead of her when we bought her. Shown three times in her juvenile career, Nectar had received fawn Color Champion honors all 3 times! This girl is beautiful from the top of her head to her toes. Her fleece has extremely nice zipper crimp, long staple, brightness, fineness, and a buttery feel. In addition, Nectar is completely uniform in her crimp style everywhere on her blanket, including well into her bib area. Nectar is well grown for her age, and has great conformation as well. Nectar is the complete, total package! 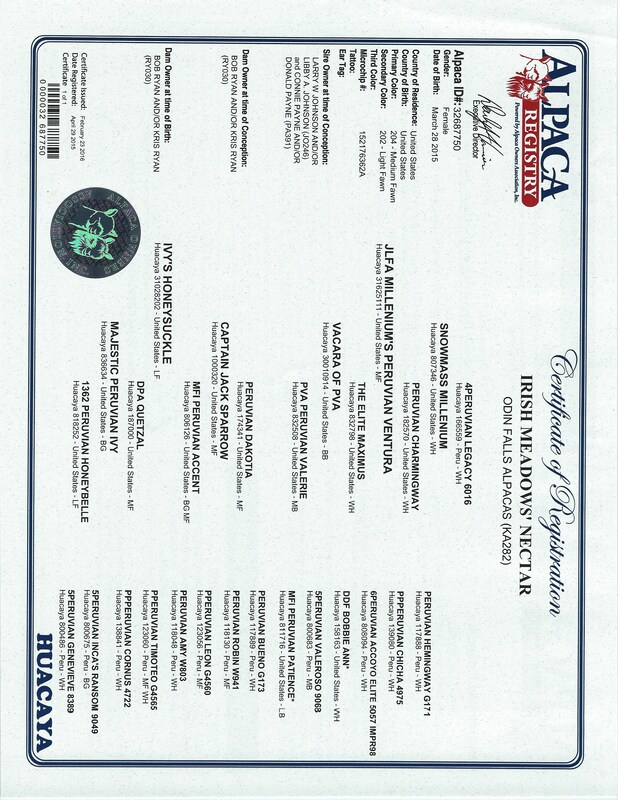 Nectar's sire Ventura is a 9 time champion, and Nectar's dam Honeysuckle is a beautiful champion herself and has also produced other multiple champion offspring. 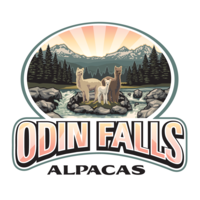 Irish Meadows' Nectar was the highest selling Female at the 2016 Priority Auction in Las Vegas and I'm proud to say, she came home with Odin Falls Alpacas. When she finishes her incredible show career, Nectar will settle down to be one of our top foundation females. 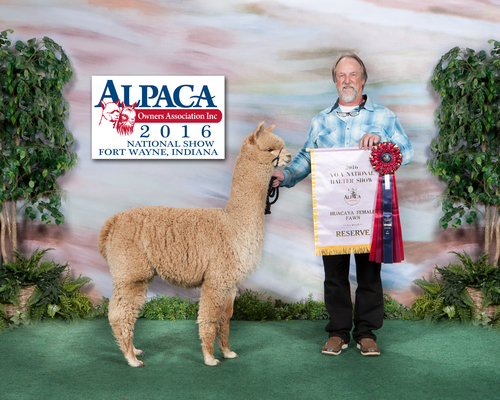 Nectar attended the 2016 Nationals and was awarded the honer of National Fawn Reserve Color Champion, placing second only to our Amber Autumn Cicily. 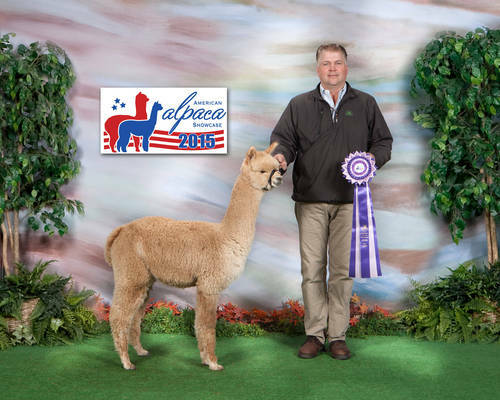 By the time Nectar left the Nationals in 2017, she was the National Medium Fawn Color Champion, best in the country. After the CABA Classic 2017, Nectar is retiring from the show ring to concentrate on building her own show string of cria. 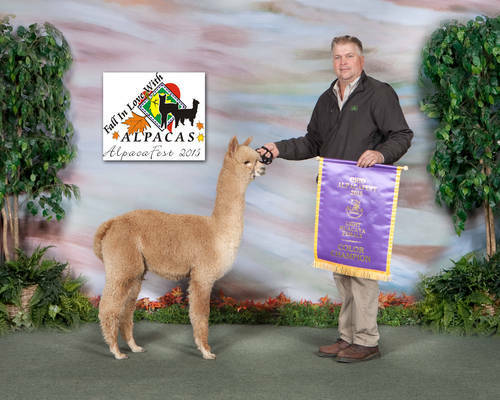 As you can see, Nectar has built up quite a reputation in the show ring with 10 Banners and 10 1st place ribbons, but is now bred to Avalon's Jacob Black whom we are hoping will produce that first unbelievable cria. Update: On 9/5/17 Nectar had a little Medium Brown Boy. We named him Odin's Valhalla and he is beautiful!!! 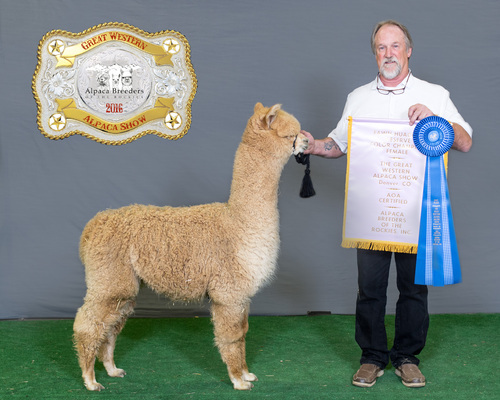 For Nectar's 2018 cria, she is bred to our 12X Champion, Crescent Moon's Accoyo Augustine. Can't wait for this one!!!!! !